The cacophony burst out of nowhere. Dozens of car horns hooted at full blast, a motorcyclist did an impressive wheelie in the middle of the street and wedding guests wound down their car windows and bellowed at the top of their voices. Most bizarrely of all, a man in a sharply cut suit gesticulated wildly from the roof of a Mini as it sped along. ‘Welcome to Marseille,’ laughed my son as the most extraordinary wedding retinue I’ve ever seen in my life sped down the Rue de la Republique. Marseille isn’t like any other French city. Not one that I’ve been to anyway. It’s loud, brash and exciting, a place where people make the rules up as they go along. When you drive through the tightly packed streets pedestrians step out in front of you, blithely assuming that you’ll either swerve to avoid them or just stop. My usually cool-as-a-cucumber husband was so perplexed by it all that he ended up driving the wrong way down a tram track, although this being Marseille no one batted an eyelid. The reason for our visit – a 2,000-mile trip by car – was to collect our son from his university year abroad in Marseille. Why didn’t he simply jump on a plane, I hear you ask? Er, because we’d rashly driven him out there last August, combining the start of his academic year with a brief holiday. The only trouble was that he loaded the car up with a bike, three skateboards, a turbo-trainer, a desktop computer, a wooden chest and every item of clothing he owns – which of course meant that he would have needed a whole plane to himself get back under his own steam. 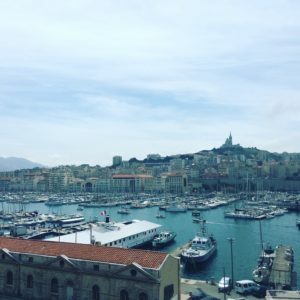 We managed to get one day in Marseille this time round, staying at Mama Shelter (which has the nicest hotel staff ever) and squeezing in a visit to the fantastic Picasso exhibition at MuCEM. Then first thing on Sunday morning we loaded the car up again, only to find that the bike, three skateboards and sundry belongings wouldn’t fit back into the car. Our son quickly jettisoned a padded bike bag on wheels, a duvet and two pillows next to the bins at Vieux Port. “Are you leaving all that?” an elderly woman asked him. He nodded – and the last thing we saw as we left Marseille was a small figure trundling a bike bag more than twice her size down the street.